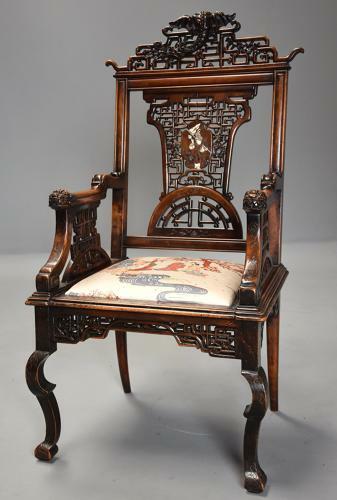 This exquisite armchair consists of a pierced and carved trellis style fret pagoda style top rail with superbly carved dragon and floral decoration (the Asian dragon being a symbol of wisdom, longevity, sexuality, fertility, procreation, and regeneration). This leads down to a moulded rail and uprights with central pierced and carved trellis fret panel with ivory inlaid Oriental dancer to the centre with lotus leaf (a symbol of purity and devotion) and cherry blossom (a symbol of the fragility and beauty of life) carved decoration to either side with semi circular decoration below. The arms are superbly carved and shaped with carved dragon faces supported by shaped and carved armrests with pierced and carved trellis design. This leads down to a drop in seat (this having an Oriental design fabric at present but this can easily be changed to a fabric of choice once purchased). Below the seat is a pierced and carved trellis design seat rail, the chair supported by two shaped and carved legs to the front with outswept legs to the back. Gabriel-Frederic Viardot (1830-1906) was a Parisian cabinetmaker specialising particularly in Chinese and Japanese style furniture, there being a demand in France at this time for exotic luxury furniture from Asia. Viardot firstly worked as a sculptor and later set up his own workshops making furniture in 1860 with many craftsman working for him. He exhibited at many exhibitions and gained many awards such as a gold medal in 1889 at the Paris International Exhibition, the following year gaining a gold medal again as well as many other awards in various exhibitions over the years and was also awarded the Knight in the Legion of Honour in 1885. Although we cannot find any evidence of signature on this chair it has many elements of a Viardot piece and is certainly a chair of superb quality, design and workmanship. This armchair is in excellent condition for age, is of stable construction and can go straight into a home and it would make a wonderful addition to any home or collection.